It’s officially Spring for me when I find asparagus at the farmers market! Gorgeous, crispy, healthy and lovely Spring vegetables with my favorite brown rice and dried fruit is my salad jam right now. I’ve been recipe testing Spring salads with Graceland Dried Fruits for weeks now and loving every minute! Plus it’s always fun to shop at the Farmers markets for recipe testing and our local one in Vancouver is open and ready with all of my market needs. I’ve always said it and I’ll say it again :)… It’s easy making good food when you start with good ingredients. That’s why I am happy to be working with Graceland again on some healthy salads, excellent snacking, and for my next tv segement on Portland’s AM Northwest. While working on this recipe I was snacking to my hearts content all of the different and perfectly dried fruits they offer. Blueberries, cranberries, and cherries, I love them all. I have these little pinch bowls that I fill with the dried fruit and some nuts for a protein and antioxidant filled snack. So easy, natural, and so good. Bar none they dry the best fruits. They are always super tender and never ever dry little sad fruits. 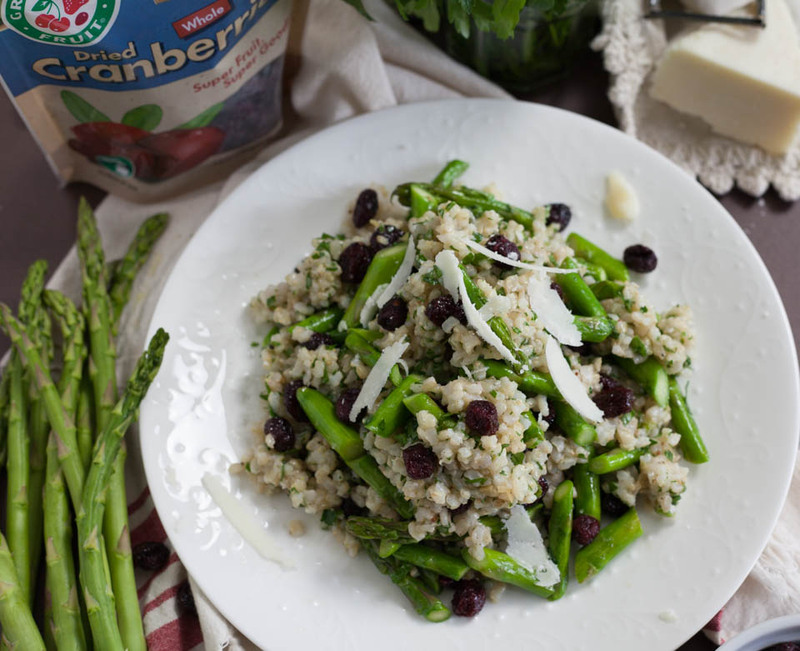 I add them to my salads, like this Brown Rice Spring Salad with Asparagus and Dried Cranberries, yogurts, granola, my purse :), baked oatmeal, and muffins! I’m so excited to share a couple of great Graceland Dried Fruit Spring salad recipes on ABC’S KATU CH2 AM Northwest with Helen on Friday April 14th from 9-10am! If you live in the greater Portland area be sure to tune in for a chance to win a $100 Fred Meyer gift card giveaway during my segment! Then head over to your local store to taste Graceland fruits at the demos starting April 14th. I made this rice salad a few different ways and landed on using a short grain arborio brown rice. I love the texture of short grain rice, typically used for risotto, but awesome for salads too. You can use the white version, I just wanted something more filling and healthy for a lunch style salad. I also made it for a side dish and it would be lovely for Brunch this weekend for your Easter delight. It’s just a really simple, great and healthy salad to make! In a medium sauté pan or 10 inch cast iron pan, add 1 tablespoon olive oil and garlic over medium high. Cook until fragrant, about 30 seconds. 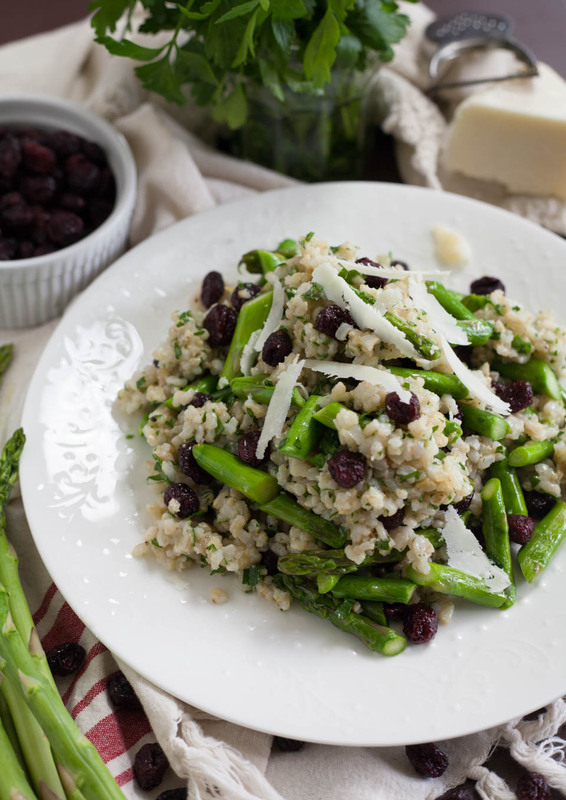 Add asparagus sprigs and quickly cook for 2-3 minutes or until bright green and still crisp. Set aside on a plate. Add 3 tablespoons olive oil, vinegar, mustard, pinch of salt and pepper into a jar fitted with lid. Shake until combined, about 20 seconds. Or add vinegar, mustard, salt and pepper to a small bowl, slowly drizzle oil in while whisking vigorously to emulsify into dressing. Add cooked rice to a large bowl, add vinaigrette and fresh squeezed lemon juice, fluff with a large fork. Allow to cool for 30 minutes. 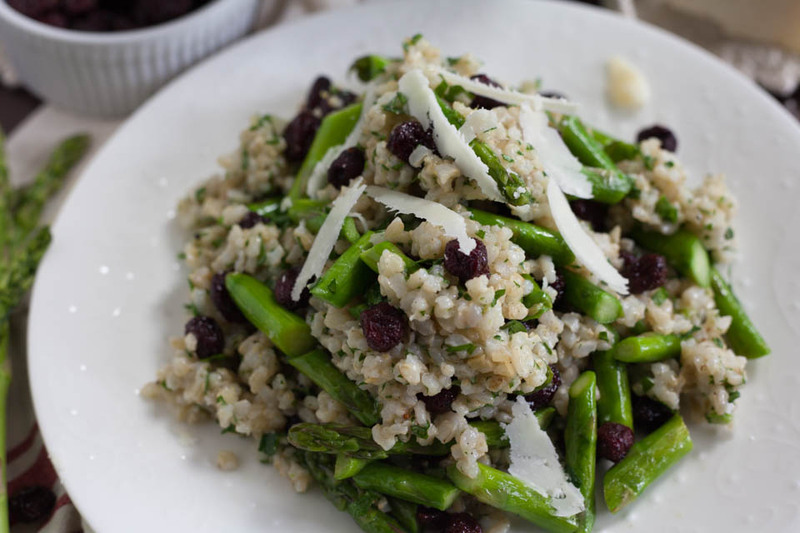 Once cooled down, add cooked asparagus, dried fruit and fresh parsley. Taste for seasoning, add salt and pepper to taste. Top with fresh shaved parm reg and serve immediately or store in fridge in an air tight container for up to 2-3 days. This salad can be enjoyed at room temperature or cold. It’s not meant to be warmed up. Disclosure: This is a compensated post in collaboration with my friends and favorite dried fruit company, Graceland Fruits. Thank you for supporting the brands that support NJB! This is truly stunning. I love the flavour combination in this recipe. I’m loving asparagus season too. I’m going to try tossing them in my next asparagus salad. This is a beautiful salad and I love the ingredients! Thank you! I adore the combination of flavors and texture with this salad. I need to make this and eat it throughout the week for my lunch at work. Thank you for this great idea! So many good things in this salad! My thoughts exactly! Thank you :). This looks so healthy and delicious! I’d love this for luch! Thank you so much! I love it for lunch, it’s been so good. 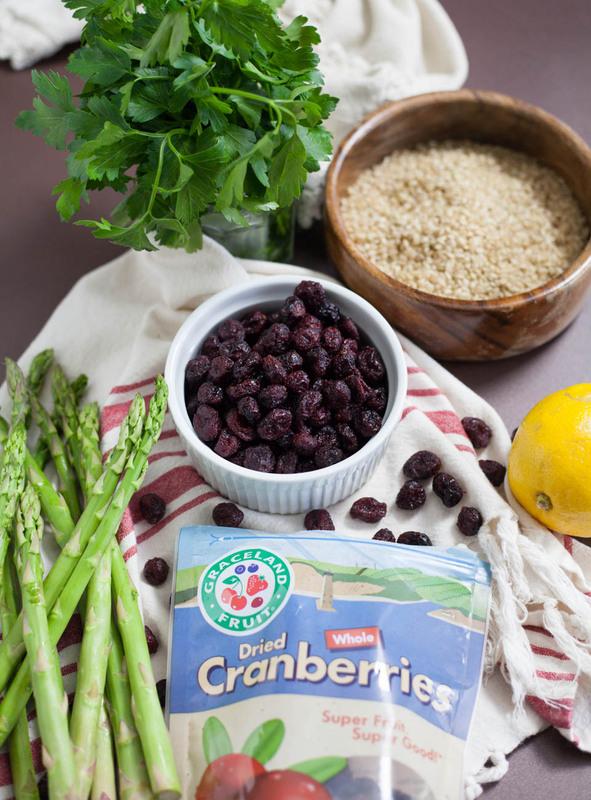 I LOVE dried cranberries in salad! I’ve actually never had a rice salad, so I gotta try this! I have everything to make this–I think I am going to do that!